Can Anyone Help the Staff of This Website Learn How to Use the Internet? Did the white dot just catch the smaller white dot? What is happening? Is this thing on? 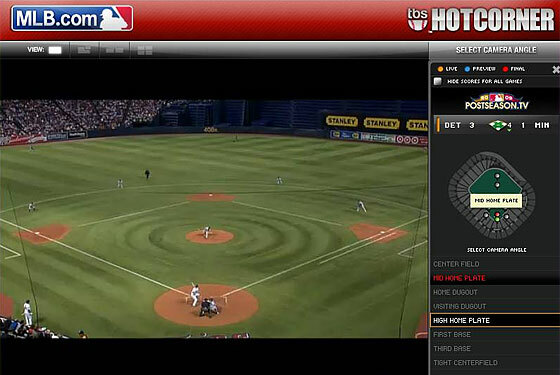 We're trying to watch the Twins-Tigers play-in game, which will determine the Yankees' first-round opponent, on MLB.tv right now, and the site insists on making us select which of TBS's eight camera angles we'd like to use. It seems improbable that there's no way to just watch the actual TBS broadcast, but we absolutely cannot figure out how to do it. Making matters worse, the "high home plate" link, which would seem to be the best way to see the whole field, was until a few moments ago taking us to a camera that appeared to be in the photographers' pit next to the first-base dugout. Please, let us know in the comments what we are doing wrong. We are 27 years old but apparently cannot use a computer. UPDATE: The feed isn't showing commercials, either, so viewers can hear announcers Ron Darling and Chip Carey talking between innings. It's not clear whether Darling doesn't know this or just doesn't care, but this is what he just said during the inning break after an errant Rick Porcello pick-off throw: "You gotta be careful throwing over to [currently in-the-news-because-he-was-taken-to-a-police-station-after-coming-home-drunk-to-his-wife-and-child-at-six-in-the-morning-on-Saturday Tigers first-baseman Miguel] Cabrera at first ... he's not usually paying much attention."